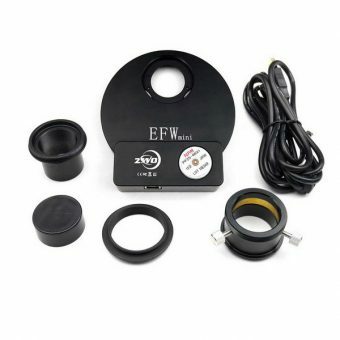 We are very excited to announce the new EFWmini Electronic Filter Wheel from ZWO. The body is CNC machined from a full block of aircraft grade aluminium. The profile is very thin at only 20mm deep. It accepts 5 standard 1.25″ mounted filters or 31mm unmounted filters. Japanese NPM stepper motors are at the heart of the EFWmini so you can trust the quality and reliability! 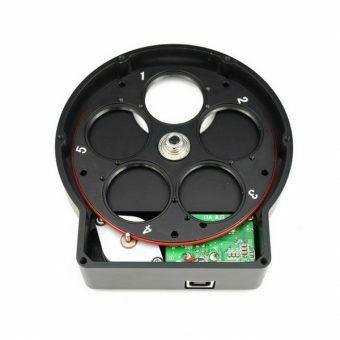 The carousel holds 5 filters and you have the choice of either 1.25″ mounted or 31mm unmounted filters. Smart electronics allows the filter wheel to rotate in both directions making filter changing fast and precise. Even better you can power it from the USB2.0 hub of ZWO’s latest cooled cameras. 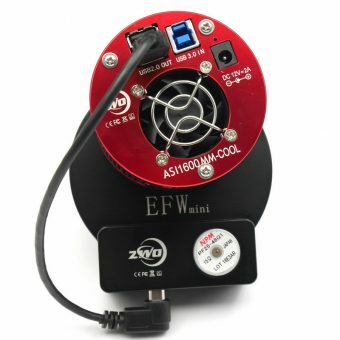 The distance between the filters and sensor is around 10mm when you connect the ASI1600 to this EFW. This means no vignetting with 1.25″ filters down to f/5. With 31mm unmounted filters vignetting won’t be a problem as fast as f/2.